We are 7 days away from our Servant Leadership Retreat. 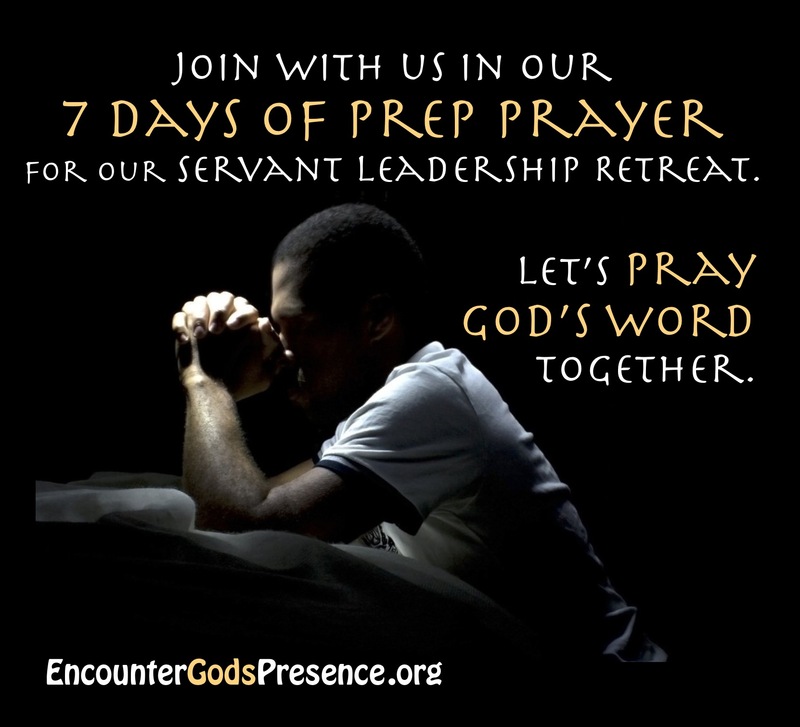 So we will begin praying Biblical prayers with our 7 Days of Prep Prayer. Special thanks to Gary Seay with helping me put these together. Feel free to forward these prayer emails (or have me add) any of your prayer warriors that may not be able to join us for the retreat but would like to pray along with us. Group leaders – Please send me emails of anyone that is also coming from your group or church so I can add them to this prayer email list or just forward them on yourself each day. Fasting – if you feel led, some will be fasting a meal or one day the week before in preparation. This is obviously not just skipping a meal(s) but that extra time spent seeking God. Please study Isaiah 58 for fasting that pleases God. Another option esp. for those who have struggled with eating disorders is to fast from something else for at least 30 min. that day, like the tv or internet and use that time pursing God. Let’s do all we can to expect and prepare for what all God has for us. As we begin to prepare ourselves for this Servant Leadership Retreat, we want to really draw near to God like we never have. Before this retreat was conceived in the heart of man, we believe it’s been a part of God’s heart and one of the many ways He wants to minister to His people. He has great plans for all of us and we want to pray that everyone that’s supposed to there will respond to God drawing them. God, we know You have awesome plans for this retreat. For those that haven’t been invited or decided yet, we ask that You would draw them in by Your Holy Spirit. We ask that all those that are supposed to be there, will make it regardless of the obstacles. Please prepare our hearts to receive all that You have for us. Heavenly Father, we are grateful that You are bringing us all together for Your glory. We pray all this is in Jesus name. Life can get too busy. Sometimes the stuff of earth seems to get in the way of us receiving what God has for us. If you’re still struggling about making it or know someone that is, please ask God for help. He is our provider. He is able to provide the finances, the time and all that is needed. He is able to guide and direct. He is able to before us to remove any obstacles. He is able to clear the path Himself. Be asking God if there are still others you need to encourage to not miss this retreat. God, we know that nothing can stand against You. When You speak mountains move and oceans part. So we’re asking again that You please remove any obstacles that’s trying to keep anyone from coming to the retreat. We ask that all the finances would come in. We pray everyone would be in good health. Please help all work and personal schedules to work out, we’re believing that You make everyone’s path clear. We love You and thank You, Father. God’s Word cannot fail. Every word He speaks has eternal power. He has prepared powerful things to say to His people. We want our hearts be good soil that when the Word goes out, it finds good soil and produces much fruit. Father God, we thank You so much for Your Word. We ask that as we come together this weekend that Your truth would be proclaimed with authority and clarity from person sharing. We ask that You open the hearts and the minds of each of us who will hear it, that as truth is spoken it finds good soil. Thank You, God, that Your Word never returns void but always accomplishes the purpose for which You sent it. God is gracious and kind. He can speak to an entire people of group and to each one there individually. He comes to heal, restore, revive. He speaks life. The same God who spoke the world into being still speaks to His sons and daughters today. God, we thank You that still speak to Your people. You still move and are still doing miracles. At the retreat, we ask God that during the ministry times and the prophetic times that You would do what only You can do. Speak clearly to us. Prepare each of our hearts to receive all that You have. Minister to Your people. Heavenly Father, You’re so powerful and mighty, yet so good and kind that You allow us to become close to You. We trust that You know exactly what needs to be spoken. Thank You for the strength & powerful words You will give us this weekend. Our Heavenly Father delights in the praises of His people. He has promised to dwell in our praises. Worship is not merely something we do, it is an expression of who we are. We are His people. He is our God. He is worthy of all the praise. Let’s pray that the worship times are truly transforming and we really encounter God’s presence. God, You alone are worthy. There is none like You. We thank You for tearing the veil (Matthew 27:51) so that we can enter into Your throne room. We can now enter boldly knowing You are there and have amazing grace for us. We ask that as we gather together this weekend to worship that You would use Heidi and the rest of the EGP worship band to lead us into Your throne room and You would meet us in a powerful way. We know when are You are lifted up You will draw all people. Help us to be more and more aware of what a privilege it is to worship in Your presence. God has tremendous plans for this weekend. Are we ready? No one can know exactly what God has planned. All He ask is that we come out and receive. May God prepare our hearts to receive all that He has in store for us. Heavenly Father, we can’t wait to experience what You have planned at the retreat. Everything that You do is good. So we know, You have good things in store for us. Please prepare our hearts to receive. And God, we ask that You open our eyes to see what You are doing. Events like this take a lot of planning and preparation. Getting groups or even just yourself with everything that’s going on our lives can add stress. But let’s all just choose to walk in God’s peace. Let’s choose not to worry about all those things and give them over to God – He’s got it. Let’s focus on Him and His goodness and He will fill our minds with peace. God, we thank You for this retreat and how You’re going to impact our lives. We pray against any issues with instruments, sound equipment or media. We ask that You help it all to work the way it should. We want to use it all for Your glory. We pray safety for every person traveling. May they travel in perfect peace. We ask that every plan made succeed for Your glory. We reject fear and worry and receive Your peace. Help us to continue to prepare our hearts to expect awesome things from You this weekend. Thank You that Your peace will guard our hearts and minds (and al the other stuff) in Jesus name.